1Department of Cardiology, Royal Hospital, PC 111, Muscat Airport, Sultanate of Oman. 2Oman Heart Association, Muscat, Sultanate of Oman. 3Ministry of Health, Muscat, Sultanate of Oman. 4Sultan Qaboos University Hospital, Muscat, Sultanate of Oman. 5Diwan Medical Services, Muscat, Sultanate of Oman. 6Armed Forces Hospital, Muscat, Sultanate of Oman. 7Royal Oman Police Hospital, Muscat, Sultanate of Oman. *Address correspondence and reprints request to: Mohammed H. El-Deeb, Department of Cardiology, Royal Hospital, PC 111, Muscat Airport, Sultanate of Oman. El-Deeb MH, Al-Riyami AM, Sulaiman KJ, Al-Riyami AA, Al-Mukhaini M, Al-Rawahi N, et al. Clinical Pathways for Non-ST Elevation Acute Coronary Syndrome in Oman: An Oman Heart Association Protocol for Hospital Quality Improvement Initiative. Oman Med J 2014 Jan; 29(1):8-11. In 2012, Oman Heart Association (OHA) published its own guidelines for the management of patients with unstable angina/non–ST-elevation myocardial infarction, the aim was not to be comprehensive but rather simplified and practical in order to reduce the gap between the long comprehensive guidelines and our actual practice. However, we still feel that the busy registrars and residents need simpler and direct clinical pathways or protocol to be used in the emergency departments, coronary care units and in the wards. Clinical pathways are now one of the main tools used to manage the quality in healthcare concerning the standardization of care processes. It has been shown that their implementation reduces the variability in clinical practice and improves outcomes in acute care. Keywords: Acute coronary syndrome; Non-ST elevation; Unstable angina; Myocardial infarction; Oman Heart Association. Oman Heart Association has recently published the 2012 Simplified Guidelines for the Management of Patients with Unstable Angina/Non-ST Elevation Myocardial Infarction.1 The recommendations are similar to published international guidelines,2-9 but suited for local physicians in a simplified manner. Here we publish the clinical pathways which are exclusively based on these guidelines. The aim of these clinical pathways is to provide the busy physicians in Oman with even more simple and direct approach towards implementing these guidelines into clinical practice. The emphasis is on the balance of patient's risk between ischemia and bleeding and on the optimum usage of the available medications and facilities. An attempt was made to best include all the medications available in the different health organizations all over the country to really represent a national reference. A. Ischemic Risk: Indicators of Early Significant Risk in Patients with Non-ST Elevation Acute Coronary Syndrome. 13. Procedural factors: Femoral artery access, Prolonged procedure,intra-aortic balloon pump, right heart catheterization. 1. Bed rest in coronary care unit (CCU) or monitored bed. 2. Oxygen: 2 L/min nasal cannula (titrate to keep arterial saturation >90%). 3. Nitroglycerin (NTG): 0.4 mg sublingually (SL) every 5 min for a total of 3 doses; afterwards, assess need for intravenous (IV). NTG IV – start infusion at 5 -10 μg/min, then titrate up by 10 μg/min every 5-10 min until relief of symptoms or SBP ≤100 mm Hg or maximum of 400 μg/min. 4. Morphine: If pain is not relieved. Give IV bolus 2 - 5 mg, with careful BP monitoring, repeated doses can be administered every 5 to 30 minutes. If respiratory depression develops, naloxone (0.4 to 2.0 mg IV). 5. Beta-blockers: A. Oral beta-blocker: should be initiated within the first 24 hours. Hold if: signs of HF, evidence of a low-output state, increased risk for cardiogenic shock (age >70 years, SBP <120 mm Hg, heart rate (HR) >110 bpm or HR <60 bpm, increased time since onset of NSTE ACS symptoms), or other relative contraindications to β-blockade (PR interval >0.24 s, second- or third-degree heart block, active asthma, or reactive airway disease). Propranolol: 1 mg at a rate of 0.5 mg/min, repeated if necessary at 2-5-min intervals to a maximum of 5 mg (rarely 10 mg): 0.1 mg/kg. 6. Calcium channel blockers (CCB): CCBs may be used to control ongoing or recurring ischemia-related symptoms in: (1) patients who are already receiving adequate doses of nitrates and β-blockers, (2) patients unable to tolerate adequate doses of 1 or both of these agents, (3) patients with variant angina, (4) management of hypertension in patients with recurrent unstable angina. 1. Aspirin: Initial Dose: 300 mg; Maintenance Dose: 75 mg PO daily for all patients lifelong, including after-stenting. Conservative strategy: 75 mg daily for one year. After PCI [bare metal stent (BMS) or drug eluting stent (DES)]: 75 mg daily for one year. 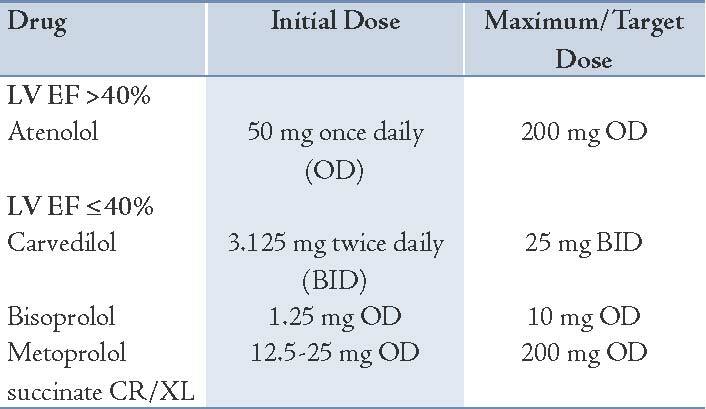 Higher maintenance dose of 150 mg daily for 6 days, then 75 mg daily for 1 year may be reasonable in patients not considered at high risk for bleeding. Upstream Use: Patients with ongoing and/or recurrent ischemia despite dual antiplatelet therapy (DAPT) and an anticoagulant. During PCI: Patients having thrombotic complications or large side branch closure or unsealed dissection and patients undergoing PCI and not adequately pre-loaded with Clopidogrel. Choose: Tirofiban Dose: Bolus-Only Strategy: 0.25 mcg/kg, or Standard regimen: IV infusion of 0.4 μg/kg/min for 30 min (reduce to 0.2 μg/kg/min for CrCl <30 mL/min), followed by IV infusion of 0.1 μg/kg/min for 18-24 hours (reduce to 0.05 μg/kg/min if CrCl <30 mL/min). Currently available agents in Oman are unfractionated heparin, enoxaparin and fondaparinux. Choice of anticoagulant agents depends upon the balance between the ischemic and bleeding risk. 2. When immediate or urgent CAG is indicated, especially if the patient will most likely undergo CABG (diabetic with widespread ST-depression and/or ST-elevation [>1 mm] in lead aVR or multiple wall motion abnormalities). Duration: For the duration of hospitalization or until PCI or CABG is performed. c. Patients with GFR between 30 and 60 ml/min. Avoid using if CrCl <30 ml/min. Dose: 2.5 mg SC once daily. c. Patients with an increased risk for bleeding, if fondaparinux is not available. Dose: 60 U/kg IV bolus (not to exceed 4000 U), followed by IV infusion of 12 U/kg/h (not to exceed 1000 U/h) to achieve goal aPTT 1.5 to 2.0 times control (approximately 50 to 70 s); check aPTT in 6 hrs and adjust heparin as indicated. A. ACE inhibitors SHOULD be given-unless contraindicated- within the first day of admission and continued indefinitely for NSTE ACS patients with: 1. HF, 2. LV dysfunction (LVEF <40%), 3. Hypertension, 4. Diabetes mellitus, 5. Chronic kidney disease. B. ACE inhibitors MAY be given-unless contraindicated-during the course of hospitalization and continued indefinitely for ALL the other patients with NSTE ACS. C. An angiotensin receptor blocker should be prescribed to those NSTE ACS patients who are intolerant of an ACE inhibitor. 2. 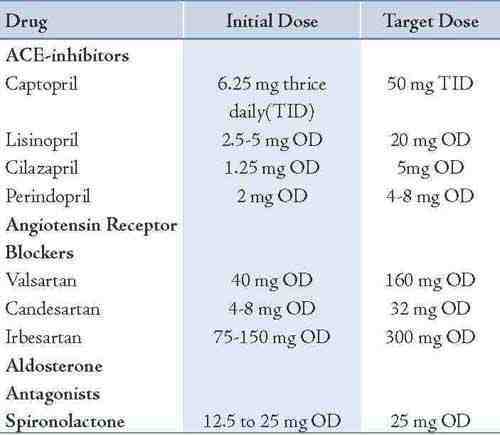 Aldosterone Receptor Antagonist: Indications: Patients without significant renal dysfunction (estimated creatinine clearance should be >30 mL/min) or hyperkalemia (potassium should be ≤5 meq/L) who are already receiving therapeutic doses of an ACE inhibitor, have an LVEF ≤40%, and have either symptomatic HF or diabetes mellitus. Statins, in the absence of contraindications, should be given to all NSTE ACS patients regardless of baseline LDL-Cholesterol and diet modification. Therapy should be initiated or intensified to achieve an LDL-C <2.6 mmol/L or <100 mg/dL. Further titration to <1.8 mmol/L or <70 mg/dL is reasonable. Choose: Atorvastatin 80 mg/day OD. If triglycerides are ≥5.6 mmol/L or 500 mg/dL, Fenofibrate 150 or 300 mg OD should be started to prevent pancreatitis before LDL-lowering therapy is recommended. In high-risk patients, a routine invasive strategy is generally preferred if there are no contraindications to coronary angiography. Among intermediate-risk patients, the benefits of an invasive approach are attenuated but still present; among low-risk patients, no benefit exists for the routine invasive approach. 1. Hemodynamic instability or cardiogenic shock. 4. Recurrent or persistent rest angina despite intensive medical therapy. 5. New or worsening MR or new VSD. 1. Prior PCI within six months or prior CABG. 2. New or presumably new ST segment depression. 4. Recurrent angina or ischemia at rest or with low level activity. Cardiovascular diseases are currently the leading cause of death in Oman, compared to western patients, our patients have a higher prevalence of cardiovascular risk factors mainly diabetes, hypertension and overweight. Although our in-hospital mortality rates are similar to the western registries, this may be misleading since our patients are about a decade younger than patients in the Western registries. We hope that these clinical pathways will help cardiac caregivers in the front lines to improve outcomes of our NSTE ACS patients. 1. El-Deeb MH, Al Riyami AM, Al Riyami AA, Sulaiman KJ, Shahrabani R, Al Mukhaini M, et al; OHA ACS Task Force. 2012 Oman Heart Association simplified guidelines for the management of patients with unstable angina/non-ST-elevation myocardial infarction. Crit Pathw Cardiol 2012 Sep;11(3):139-146. 2. Jneid H, Anderson JL, Wright RS, Adams CD, Bridges CR, Casey DE Jr, et al. 2012 ACCF/AHA focused update of the guideline for the management of patients with unstable angina/non-ST-elevation myocardial infarction (updating the 2007 guideline and replacing the 2011 focused update): a report of the American College of Cardiology Foundation/American Heart Association Task Force on Practice Guidelines. J Am Coll Cardiol 2012 Aug;60(7):645-681. 3. Levine GN, Bates ER, Blankenship JC, Bailey SR, Bittl JA, Cercek B, et al; American College of Cardiology Foundation; American Heart Association Task Force on Practice Guidelines; Society for Cardiovascular Angiography and Interventions. 2011 ACCF/AHA/SCAI Guideline for Percutaneous Coronary Intervention. A report of the American College of Cardiology Foundation/American Heart Association Task Force on Practice Guidelines and the Society for Cardiovascular Angiography and Interventions. J Am Coll Cardiol 2011 Dec;58(24):e44-e122. 4. Fitchett DH, Theroux P, Brophy JM, Cantor WJ, Cox JL, Gupta M, et al. Assessment and management of acute coronary syndromes (ACS): a Canadian perspective on current guideline-recommended treatment--part 1: non-ST-segment elevation ACS. Can J Cardiol. 2011;27 Suppl A:S387-401. 5. Hamm CW, Bassand JP, Agewall S, Bax J, Boersma E, Bueno H, et al; ESC Committee for Practice Guidelines. ESC Guidelines for the management of acute coronary syndromes in patients presenting without persistent ST-segment elevation: The Task Force for the management of acute coronary syndromes (ACS) in patients presenting without persistent ST-segment elevation of the European Society of Cardiology (ESC). Eur Heart J 2011 Dec;32(23):2999-3054. 6. Steg PG, Huber K, Andreotti F, Arnesen H, Atar D, Badimon L, et al. Bleeding in acute coronary syndromes and percutaneous coronary interventions: position paper by the Working Group on Thrombosis of the European Society of Cardiology. Eur Heart J 2011 Aug;32(15):1854-1864. 7. Chew DP, Aroney CN, Aylward PE, Kelly AM, White HD, Tideman PA, et al. 2011 Addendum to the National Heart Foundation of Australia/Cardiac Society of Australia and New Zealand Guidelines for the management of acute coronary syndromes (ACS) 2006. Heart Lung Circ 2011 Aug;20(8):487-502. 8. Cannon CP, Braunwald E. Unstable Angina and Non–ST Elevation Myocardial Infarction. In: Bonow et al. Braunwald's Heart Disease: A Textbook of Cardiovascular Medicine, 9th ed, Elsevier 2012. 9. Cannon CP. Strategies and Therapies for Reducing Ischemic and Vascular Events (STRIVE): updated standing orders for ST-segment elevation myocardial infarction and unstable angina/non-ST-segment elevation myocardial infarction. Crit Pathw Cardiol 2010 Jun;9(2):55-81.